Sheen Magazine – Bronner Brothers International Beauty Show Announces New Host! 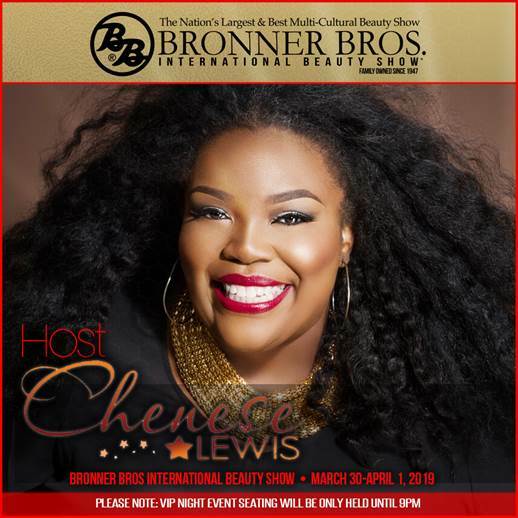 Bronner Brothers International Beauty Show Announces New Host! In just a couple of weeks, the Bronner Brothers International Beauty Show will take place in New Orleans, Lousiana for the first time in the 72 year history of the show! The three-day event will take place at the Ernest N. Morial Convention Center on March 30th-April 1st, 2019! We’ve just learned that national personality and beauty influencer, Chenese Lewis is also set to host the 2019 New Orleans Natural Hair Expo during the Essence Music Festival for the sixth consecutive year! The Bronner Brother’s International Beauty Show brings together the industry’s diverse mix of stylists, barbers, beauty influencers, and students! Each year, you can expect education, exhibits, competitions, and entertainment throughout the entire weekend. Purchase your tickets today by clicking here!